"I announce to you that the hour of the great trial is on the point of arriving. The great trial has arrived for your country. How many times, as a concerned and sorrowing mother, have I endeavored to urge my children to follow the path of conversion and of return to the Lord. I have not been listened to. You have continued to walk along the way of rejection of God, and of His law of love. Sins of impurity have become ever more widespread, and immorality has spread like a sea which has submerged all things. 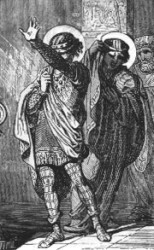 Homosexuality, a sin of impurity which is against nature, has been justified; recourse to the means of preventing life have become commonplace, while abortions - these killings of innocent children, that cry for vengeance before the face of God - have spread and are performed in every part of your homeland.The moment of divine justice and of great mercy has now arrived. The above prophecy of course is for your discernment; however it is definitely applicable to our current day. There is such an urgency crying out from Heaven for all to be more holy and prayerful. Let us spend this Lent doing that. Let us rid ourselves of our worldly attachments, widdle down the time we spend on frivolous activities. Let us give our time to the Lord in the form of daily Mass, Rosary, and Chaplet of Divine Mercy, weekly Eucharistic Adoration, visits to the Blessed Sacrament, Spiritual Reading and quality prayer time. Let us all see where the Holy Spirit is leading us this Lent. Let us go in to the desert with OUR LORD. And let OUR LADY be our guide. Let us all say a "Hail Mary" for all those who have been devastated by storms in the last week. There is Mynamar stricken by a cyclone, where many affected by the storm aren't able to receive basic nutrition ; due to the rebel government's intercession of foreign aid. There is now word that a new storm may be heading to that region again. Please pray for them! There is China, recently devastated by an earthquake where the death toll is massive. In the Midwest deadly tornadoes have killed over 20 people. Fires rage in Florida. Do you feel a prophetic pulse? I think that most religious and secular people would agree that the storms around the world have been increasing in intensity. I must admit I don't receive any special warnings or prophetic insights from the Lord; I am just a simple Catholic wife and mother who loves the Lord. However, there are those that have been gifted with prophecy. One person of interest is Mark Mallet, Catholic musician and songwriter who has a blog entitled Spiritual Food for Thought. In a recent post he discusses the current devastations, and how we can view this from a spiritual perspective. Also, Michael Brown's blog called Spirit Daily is a good source for keeping with the world's events from a Catholic perspective. This is an interesting post about Prophecy. As faithful Catholics one must be careful not to be fooled by those claiming to know God's every move. We must spiritually discern, and not get distracted by all sorts of foolish claims and visions. Our God is loving and merciful; but also a God of justice. I can't help but think that with Abortion, Euthanasia, Embryonic Stem cell research, Human Cloning, and Homosexual marriage running rampant that God's patience is running out. Please pray for our world! It is not a time to be restless or panic about the world's problems but instead to work on our own souls. If it has been awhile since your last Confession; then I urge you to go. We never know when the Lord will call us home and we should be ready at all times. Take refuge in Our Lady... Consecrate yourself to her. She will cover you with her protective mantle. If you haven't already, get enrolled in the Scapular and wear a Miraculous Medal. Our Lady will help you grow in love with her Son in the Eucharist. 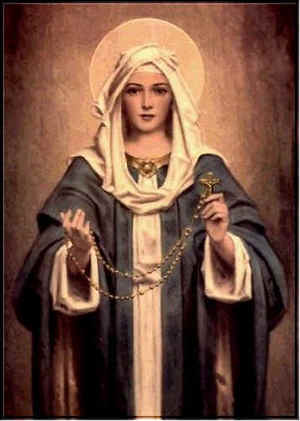 One way to grow closer to Our Lady is to pray the rosary. If you haven't prayed one lately, or you never have; try this site . Try to say a rosary each day for your loved ones, lost souls, and those devastated by recent storms and earthquakes. Our Lady is a gentle loving mother who wants us to grow closer each day to her Son. However, Father John Corapi once said in Marian conference I attended " Your Mama wears combat boots!" This vision of the Blessed Mother stuck with me, and now I not only look to Mary as a gentle mother but as my "Spiritual Warrior" who helps me to fight my daily spiritual battles. How is your relationship with the Blessed Mother?